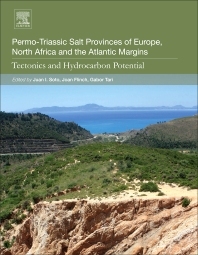 Permo-Triassic Salt Provinces of Europe, North Africa and the Atlantic Margins: Tectonics and Hydrocarbon Potential deals with the evolution and tectonic significance of the Triassic evaporite rocks in the Alpine orogenic system and the Neogene basins in the Iberian Peninsula, North Africa, and the western Mediterranean. As the nature of the Triassic evaporite sequences, the varied diapiric structures they feed, and the occurrence of hydrocarbons suggest that the Triassic evaporites represent an efficient system to trap hydrocarbons, this book explores the topic with a wide swath, also devoting content to a relatively unexplored topic, the mobilization and deformation of the Triassic salt in the western and northern Tethys (from Iberia and North Africa, Pyrenees and Alps, Adriatic and Ionian) during the subsequent Alpine orogenic processes. The book includes chapters updating varied topics, like the Permian and Triassic chronostratigraphic scales, palaeogeographic reconstructions of the western Tethys since the Late Permian, the petroleum systems associated with Permo-Triassic salt, allochthonous salt tectonics, and a latest revision of salt tectonic processes in the Permian Zechstein Basin, the Atlantic Margins (from Barents Sea, Scotia, Portugal, Morocco, and Mauritania), the Alpine folded belts in Europe, and the various Triassic salt provinces in North Africa. Juan I. Soto is a Professor of Geodynamics in the Granada University and in the Instituto Andaluz de Ciencias de la Tierra, Spain, working in structural geology and tectonics. His expertise includes salt and shale tectonic processes, seismic interpretation, late orogenic extension, and metamorphic and thermal evolution of extended terrains. He has worked in the Betics and the Alboran Sea in the Western Mediterranean, the Caspian Basin, the eastern Caribbean basins and the Mexican Gulf of Mexico. He has analyzed the structural and basin evolution during the mobilization of clay-rich, overpressured sediments comparing the resulting structures with those formed by salt tectonic processes. Dr. Flinch received his Ph. D. in Geology and Geophysics from Rice University. Before joining Repsol he worked as a consultant for Lagoven (ancient affiliate of PDVSA) in Venezuela and for Total on numerous exploration projects in Latin America and western Africa. He has published many papers on structural geology of the Pyrenees, structural geology and sequence stratigraphy of the Rif in Morocco, the Allochthonous salt of the Betic Cordillera in Spain, the Northern Colombia Accretionary Wedge, the Eastern Venezuelan folded belt, the Gulf of Paria in Trinidad and Venezuela, the Subandean area in Bolivia, and the Sierra Leone-Liberia margin in West Africa. Expertise: global hydrocarbon exploration, new ventures exploration, regional and tectonic analysis, seismic Interpretation and structural geology. Gabor Tari holds an MSc degree in Geophysics from Eötvös University of Budapest, Hungary, and a Ph.D. in Geology and Geophysics from Rice University, Houston, Texas. After starting with Amoco on Romanian exploration projects in 1994, he transferred to the Angola Team in 1996. Gabor continued to work at BP Amoco until 1999 when he joined Vanco Energy Company. At Vanco, as Chief Geophysicist and then as Vice President of Geosciences, he worked mostly on projects in Africa. Since 2007, Gabor has been with OMV in Vienna, Austria, working as the Group Chief Geologist on various Mediterranean, Middle Eastern and African basins. Thanks for the review, Juan! We are thrilled to hear you like our content.